Did you know that it used to be the custom to fight at Scottish funerals until blood was drawn? If you've ever wanted the definitive answers on subjects such as black cats, magpies and spilt milk, look no further than this classic, critically acclaimed dictionary. Hundreds of superstitions and beliefs, including spells, cures, rituals, taboos, charms, and omens are covered, and illustrated by quotations that trace their development through the centuries. Subjects include advice on the signs to observe when getting married, the significance of animals, plants, stones, colours, food and drink, the elements and heavenly bodies, precautions to be taken after a death in the house, and many more. Superstitions are arranged alphabetically by subject, and fully cross referenced for easy browsing. 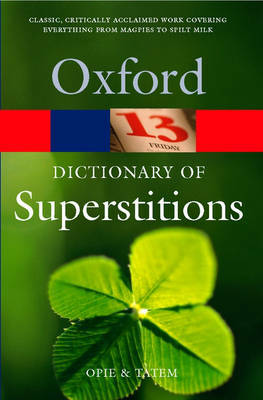 In addition to providing quotations illustrating references to superstitions in everyday life , the dictionary also contains a wealth of information illustrating the history of popular superstition. For example, the lucky horseshoe was protection against witches in the sixteenth century, and touching wood may be a lingering memory of the veneration attached to the relics of the cross. Both informative and accessible, this dictionary is a browser's delight, and a fascinating work of reference for anyone with an interest in superstitions and their history.